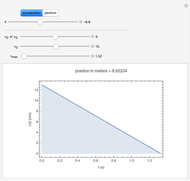 Solve one-dimensional kinematics problems with constant acceleration for a single object. 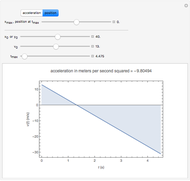 All such problems can be solved by selecting either "acceleration" (two of the three variables, , , and are known), or "position" (two of the three variables, , , and are known, where is acceleration, is the velocity at time 0, and is time). At the outset, a position at time 0 must also be chosen using the or " slider. 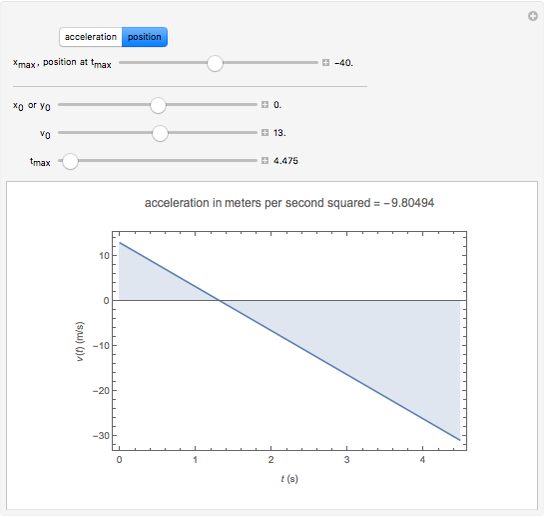 The position is given at the top of the "acceleration" graph and depends on changing the other variables. 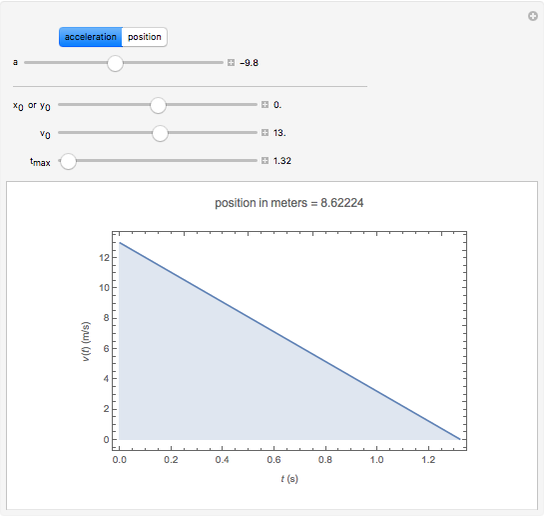 Similarly the acceleration is given at the top of the "position" graph. Velocity is given by the straight line on the graph, and the position at time is represented by the total shaded area. Example: A ball is thrown straight up with speed of 13.0 m/s from the top of a 40.0 m tall building. (a) How high above the building's rooftop does the ball rise? (b) If the ball misses the building on the way down, how much time does it take for the ball to strike the ground after it is thrown? (c) What is the ball's velocity as it strikes the ground? This Demonstration lets you solve problems without using equations. Daniel M. Smith, Jr. "1D Kinematics Problem Solver"